Our detailed review of Freelancer, an international outsourcing platform which helps businesses find and hire freelancers for almost any type of online project. Freelancer is probably the most diversified online freelance market at the moment. While it does offer basically the same range of online and computer-based jobs as sites like UpWork, it also has a section for “Local Jobs & Services” which allows you to hire someone in your geographical area for anything from computer help to plumbing or contracting. A worldwide site, Freelancer is hugely diverse and a great option for meeting your freelance needs. 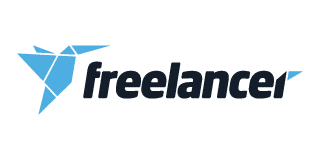 Founded in 2009 in Australia, Freelancer has grown steadily and has acquired numerous online freelance marketplaces around the world in the past ten years. With forty-four regional marketplaces, thirty-four languages, and twenty-one currencies supported by the site, it is truly an international company. The process on Freelancer is very similar to that of UpWork and Guru, sites which fall into what we call the “dating” model. Clients can post jobs or projects via a simple proposal that includes a title, a short description of the work, required skills, and an indication the desired budget. One aspect unique to Freelancer is that this can be done as a contest for some categories (where a winner is chosen after submission of multiple entries), but most often, the job posting is simply a brief outline of the job, and a freelancer is hired before work is done. The definition of the budget in the proposal is a little bit more detailed than most sites and involves choosing from a list of ranges that limit the hourly rate or one-time budget. You will also have the choice to upgrade from a standard project to a Recruiter Project (in which they will handpick suggested freelancers for you) or to add other paid features to your project. After publishing the job, Freelance members can begin to bid on the project with their own proposed rates and timetables. It is also possible to send the project directly to specific freelancers rather than waiting for them to respond. Once proposals start coming in, usually within minutres or hours of posting, the client can review proposals and freelancer profiles to look for possible good fits. Communication can be handled through the site in order to ask more questions and choose the right freelancer, at which point you can send a contract with the exact terms of the agreement. If payment is hourly, you will be charged at the end of each week for the hours logged the previous week. If the payment is in lump sums, then you can include milestones in the project which will be funded and paid out one at a time as they are completed. Both communication and payment can be conducted through the site systems to ensure security at all times. Our conclusion for this Freelancer review is that this is a great choice for those who need jobs done quickly, as long as you are planning to spend more than $60 or so on your project (bringing the minimum fee down to 5%). The option to hire locally for in-person jobs or to hold a competition instead of hiring outright may be huge perks for certain needs, and Freelancer definitely has a wide variety of freelancers who can get your jobs done quickly. Other than the $3 minimum fee, the cost is a strength, as the prices can be negotiated depending on what freelancer you choose to work with. Like UpWork and some other sites, the majority of the members are not vetted, so it does require some time and effort to dig through their profiles and ask some questions before hiring, but Freelancer does a good job of putting relevant information in their user profiles to help you. There is also the option to pay for a Recruiter project if you want some help finding the perfect person. Overall, this site has a lot of options to meet your specific freelance needs, but for really small jobs, you may be able to get a better deal elsewhere.